Howe View017687 78593work Bed & BreakfastHowe View is situated in the quiet village of Braithwaite near Keswick in the Lake District. The house has tremendous views across the valley, looking towards Keswick and beyond, where you can see the sun rise from behind Latrigg, the Skiddaw range and part of the Newlands Valley. It is also possible to see as far as the Pennines to the east. There is always a warm welcome at Howe View, and Linda will provide you with whatever you require for breakfast, full English or continental. Newly installed this year for Howe View visitors is an outdoor hot tub which is situated on the fellside just to rear of the house, this is truly a magnificent setting to take a relaxing spa with balcony one of the finest views in the Lake District, day or night! Free use of the hot tub! There is a welcome tray on arrival, TV, complimentary toiletries, tea and coffee making facilities, packed lunches on request. Also while you are here feel free to take advantage of their extensive local knowledge of the surrounding area. Both have always lived in the Keswick area and have their finger on the pulse for whatever you might want to do. 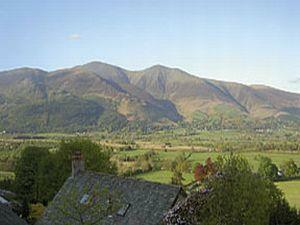 Howe View is situated in the quiet village of Braithwaite near Keswick in the Lake District. The house has tremendous views across the valley, looking towards Keswick and beyond, where you can see the sun rise from behind Latrigg, the Skiddaw range and part of the Newlands Valley. It is also possible to see as far as the Pennines to the east. Check-in times 14.30 to 22.30 or by arrangement. Adults are welcome to use the hot tub in the garden. Children welcome from any age. Leave M6 jct 40, taking the A66. Turn off into Braithwaite village, 2 miles west of Keswick and head for the middle of the village to the Royal Oak public house. Take the second small road right after the car park. Howe View is up the third drive on the left.